Ranked by the Law School Admissions Council, as one of the nation’s top producers of minority and Hispanic law school applicants, the Pre-Law Institute continues to prepare John Jay students and new alumni to successfully enter law school and the legal profession. Led by Dr. Charles Davidson, the Institute offers academic skill-building programs and professional development initiatives resulting in over 100 PLI alumni enrolling in top law schools each year. The PLI Benefit Breakfast aims to provide critical support for these skill-building initiatives. They allow for our students, many of whom are first-generation college students and have an estimated per capita income below $11,000 per year, an opportunity to pursue and prepare for their postgraduate aspirations. Although there is no cost for admission to the breakfast, please consider making a donation. * Any donation amount will help to benefit the Pre-Law Institute and is greatly appreciated. 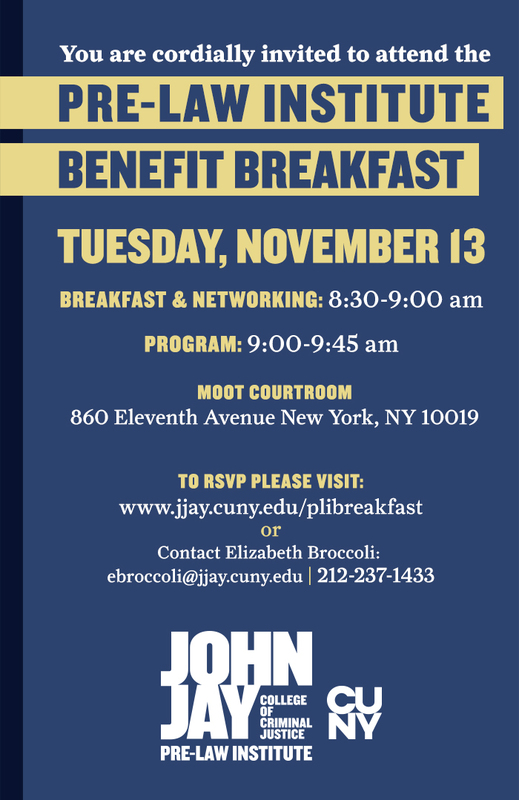 You are cordially invited to the Pre-Law Institute's Benefit Breakfast.